Present and future of Pakistan & South Asia Muslims ? 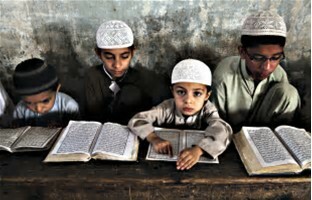 Present and future of South Asia Muslims ? Imagine the most ancient people with a highly developed genetic lineage is enslaved in a foreign ideology that propels them to break from their rich cultural past to a dark, useless, non spiritual violent life that can not ever have peace. How and why Islam thrives despite being oppressive? Islam can only thrive in an environment of total blackout, censure and total control of human voices. Pakistan and Saudi Arabia and similar countries are worried if they allow freedom they will lose their basis of survival and they wont have any ways left to abuse their own citizens and also terrorize the world to keep them on toes so that at end they all become like them. This is the whole problem with so called leaders of Pakistan and Saudi, and also other countries like Indian Muslims self appointed leaders. In reality they are as ignorant as they their most fanatic followers and they usually secretly have a more "interesting life" than their superficial claim of being real Muslim. Pakistan is perhaps one of the fastest regressing countries of the world. People go forward they are taking it backward but to wrong side of time. Pakistan is a neo colony now of Saudi Arabia from one side and China on other side. Both will be dangerous for growth of its people. Pakistanis have no identity of their own left and the confusion has only grown from last 70 years of formation of Pakistan. 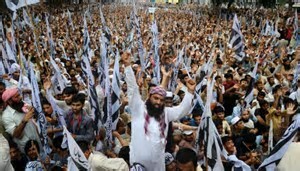 Why Pakistan wants to keep promoting a wahabi salafi Islam? It is to keep the control by a small minority of extremely clever people who have literally made fortunes by exploiting the ignorance and poverty of majority and they do not want any real education or wellbeing as they know they will lose their control. They need to keep controls and to keep all of them Hating their native culture and their past deep base of their ancestors rich history. This hatred is essential to keep them as "Different" people. They will keep hating and will do all to malign all that is India or its cultural foundations. Pakistan is based on an ideology that is absolutely imposed on the occupied and invaded people. It is like throwing a thick heavy blanket on somebody even if it is summer hot. Now they are used to that blanket and can not live without a cover. Pakistan's critical problem is that it is all guilt ridden and an extreme of pretending that we are associated with the desert Arabs of 7th century which they fully know it is totally false. So it is going to be like North Korea where people have given up on their hopes of breaking their chains. They themselves want to put the chains some for decoration, others for beauty and others for feeling staying safe. Slavery of mind and soul can literally finish a being. How to understand their mind set? To understand Converted people of Pakistan and Bengal learn that 99% of them are Indian people and they think and act like Indians and they at heart are 100 % immersed in India culture that is milleniums old, yet officially it is denied to fullest extent and even hinting at their ancient past is considered blasphemic. The same was right for current Tajiki and Afghans till about 11th/12th century. The same was also right for current Persians till about 8 to 9th century. Persians resisted and fought with invasive Arab Muslims for almost 300 years but at end they failed for not having potential to communicate. From 1979 Iran and Afghanistan fell into fanatics traps by sheer bad luck and Tajikistan remained mostly OK as it was. South Asian Muslims will realize their mistakes in a coming few years when the worldwide Islam will be fully exposed and it will possibly die a death as Middle East is in process of reaching its peak and the decay and downfall has begun. Christianity caused lot of headaches for Europe during mediaeval ages. But then it was possible to reform Christianity. Christianity and Islam are the only two religions of the world that promotes act of hate and global war for the cause of religion. But still it was possible to reform Christianity but Islam can’t be reformed. No way Islam can be reformed. But why? Here’s the answer. Christianity was not designed from the ground off to be a political system. For example, doctrines about “just war” cropped up after Saint Augustine, and arguably only after Christianity became a state religion. However, doctrines about warfighting cannot be found in the Gospels! So, if you wanted to strip-off Christianity from politics, you just needed to get rid of Augustine et al. Compare that to Islam (which is a complete political system and a political ideology to establish a global theocracy) in which we have “Allah himself” is talking volumes about every minute detail of warfare in the Qur’an. We have Allah prescribing Muslims during which months you are allowed to wage war and what should happen with the captives of war etc. Not only are these commandments built-in into the body of the most holiest of scripture – the Qur’an – but Muhammad demonstrated how to implement these commandments in real life – by waging war himself. So we see Jalaluddin Rumi had his own philosophy. He wasn’t a Muslim. He was a secular Iranian. His philosophy wasn’t Islamic but Iranic. Mysticism, metaphysics etc are rooted in the culture of Iran since from the Achaemenid times. Bayazid Bostami was a pantheist (see Wahdatul Wajud) and he was deeply influenced by Buddhism. Some of these philosophers are intentionally plagiarized by Islam for the cause of Taqqiya. And many others claimed themselves as Muslims but in reality nothing they did was Islamic and they knew that. Like singing, dancing, writing poetry, drawing etc. So eventually they were persecuted. Now let us come to the point. What is Sufism? Sufi is derived from Arabic word sawf which means purity. The ‘purest’ form of Islam according to them. They are divided into many orders and each orders set their own definition of purity based on Quran and Hadith. There are non denominational Sufis too. The Shia practices derived from Sufism. There are Sunni Sufis. Indonesia, Bangladesh, Pakistan and Egypt has a form of Islam which is predominantly Sufi form and these countries claim themselves as Sunnis. We certainly know how fanatic are the Ayatollah led Twelver Shias of Iran and Levant. We know how ‘peaceful’ are Hezbollah. Contrary to popular belief, the Sufis do not reject violent jihad. Their towering figure, al-Ghazali, taught it, and Sufis have been at the vanguard of the Chechen jihad. Hasan al-Banna, founder of the Muslim Brotherhood, which in turn gave birth to Hamas and Al-Qaeda, was strongly influenced by Sufism. In 2009, Iraqi Sufis meant with Hamas leader Khaled Meshaal and boasted of their jihad activity in Iraq. 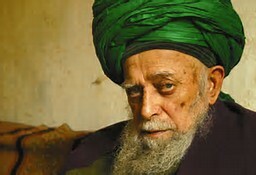 Izzat al-Douri, a Sufi leader, was instrumental in the formation of the Islamic State. The Sufi Naqshbandi order openly joined the ranks of the most notorious Muslim terrorist organization in the world; the ISIS. Nazim Qibrisi, the head of the Naqshbandi Sufi movement, gave a fiery speech in Erdogan’s presence in Germany about the coming “Sign” (The Mahdi) and how the Ottoman wound will heal and revive again to conquer once more. In contemporary Muslim culture Sufism introduced the old practice of Turko-Mongolian shamanism and plagiarized many practices of Zoroastrianism as it was combined with elements of Sufism in order to adapt to wider Islamic society. Shamanistic Sufi Islam thus expands deeply into Central Asia, the Middle East, North Africa and the Balkans and shows how the Muslim shaman, like his Siberian counterpart, cultivates personal relations with spirits to supposedly help individuals through what they believe as healing and divination. Far from Wahhabism, Sufism is the most dangerous, not only that because it teaches tremendous violence since it was the Sufis who are the muscle and sinew of the faith advancing it to become the world’s second-largest religion. Sufis are not simply a sect of Islam, but rather heirs of an ancient mystical tradition within both the Sunni and Shia branches of the faith combining their inward quest with war and expansion worldwide. Chechans, Muslims from Dagestan and probably surrounding areas, Muslims in Kashmir, are all Sufis and they show same violence towards non-Muslims as their so called violent brothers. Kashmiri sufi Muslims have driven out the entire Kashmiri Hindu Pandit population from their generational homeland in Kashmir. These Pandits became refugees in their own homeland in India. The so called Sufi “saints” who came with Mughals in India did not prevent genocide and mass murder of Hindus by Muslim kings. On the contrary they probably supported the kings for converting or killing them. More than 80 million Hindus, Buddhists, Sikhs, Jains, other non-Muslims were systematically killed , murdered, beheaded by Muslims in last 1400 years. Of course the world wide toll is more than 300 million. Shah Jalal, an Iranian fanatic Sufi leader brainwashed large amount of local people of Bengal in 12th century by converting them to Islam and then propagated jihad against local King and Hindus. He eventually managed to kill the king and became the thug of the area. Mahmud of Ghazni, the afghan Muslim who attacked India 17 times in 11th century destroyed uncountable number of temples, massacred and raped people was a Sufi. The most brutal Mughal ruler of India, Aurangzeb was a Sufi who turned the rivers of north India red by massacring Hindus. He imprisoned his father and killed his three brothers. He killed his elder brother Dara in the most brutal way because Dara left Islam and he used to study many books including Avesta, Rigveda, Tripitaka etc to gain more knowledge. He hung the beheaded head of Dara in the center of the city so that every people could see it. Even Autagzeb’s child became very angry with his dad because he killed his favorite uncle in such a brutal manner. Iran's so called revolutionaries are fake crooked Islamic fanatics and they are hated by common Iranis. They do all they can to force their devilish fanaticism among people who do not need all this nonsense. Iranis will be very happy to see de-islamicize their country but they are stuck with a horribly insane So called Islamic regime and its revolutionary guards whose job is to do all kind of spying, crimes against its people. "Under Revolutionary law, young girls who were sentenced to death could not be executed if they were still virgins. Thus, they were "married off" to Revolutionary Guards and prison officials in temporary marriages and then raped before their execution, to prevent them going to heaven. The Mullahs believed that these women were ungodly and did not deserve paradise in the next life and that if they were deprived of their virginity, it would ensure that they went to hell. Therefore, on the night prior to execution, the condemned girl was injected with a tranquiliser and then raped by her guard(s). After the execution, the religious judge at the prison would write out a marriage certificate and send it to the victim's family along with a box of sweets." Why Super religious without logic usually hate rational friends? Weak unread and extremely believing people can not stand the whole big picture that shows macro reality. The narrow view minds can not stand the light of truth and want to keep believing for fear of BEING enlightened by accident and lose their "faith". These silly people even though at times highly educated are unworthy of any friendship for their lowest content of knowledge in their head. It is better to be friendless than a crowd of idiots who pretend to be educated and pious. Muslims are in Europe ? Future of Europe? Muslims are in Europe only to finish with it and subjugate it. 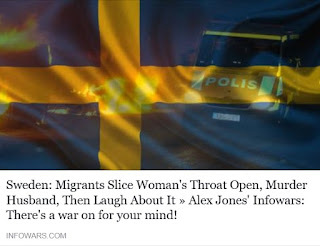 Swedish, German, French and Dutch and British politicians have been bribed heavily by Saudi Arabia and there is no resistance nor preparation so when the common Europeans begin getting slaughtered in streets and in their homes is sooner than later. People in Europe can be complacent but will they wake up when their family members will be beheaded in streets? The local police will not be able to save the European cities and The NATO and armed forces can not save the citizens. Will Europe wake up? Not really. This is going to be next SYRIA.